But what if you're using paper? Today we’re going to dive into some ideas I’ve got for taking notes in class more quickly – but first, let’s talk a bit about computers. See, part of my brain is completely A-OK that computers will someday be our all-powerful overlords. After all, they’re just so darn efficient. Take, for instance, my email. I get a lot of email, and that means I get a lot of messages that require the same exact answer. Luckily, I don’t have to type this answer over and over – instead, I’ve got a handy little Chrome extension called Gorgias, which lets me create text templates and bind them to small keywords. So let’s say someone emails me and wants me to do something – collaborate, write them an article, take down a rampaging, skyscraper-sized lizard with my bare hands, whatever. Since I’ve already defined my priorities and have a lot on my plate, I often have to turn these types of emails down – yet, a curt “no” would seem a bit cold. Instead of typing out a big explanation and apology, though, I can now just type out the word “busy”, hit the Tab button, and an entire pre-written message pops in. Then I just hit Tab-Enter to send the email, and I’m off to the next task. 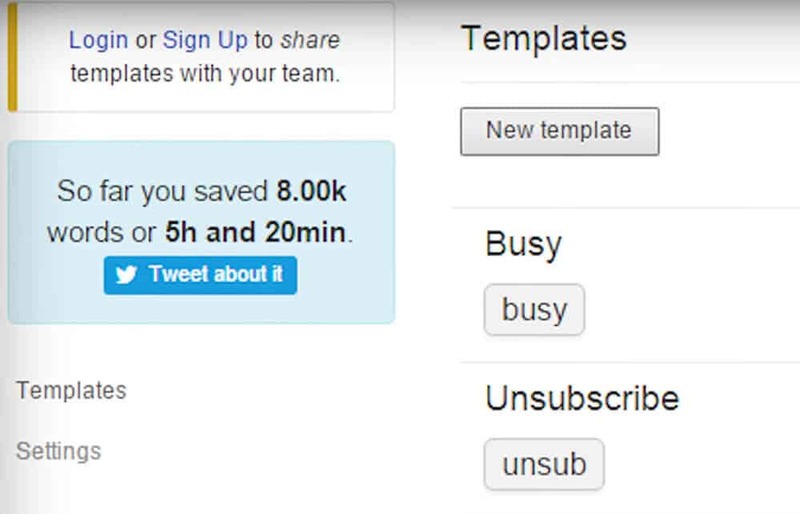 Over the past few months, I’ve been steadily developing more and more Gorgias templates, and according to the app’s stats, I’ve already saved five hours of typing time. Not too bad! Now, Gorgias isn’t the only app that can do this (it just suits me because I do most of my repetitive typing within Chrome). TextExpander and Alfred (with the Power Pack add-on) can do this system-wide on OS X, and TextExpander also has an iOS version. For Windows and Android users, there’s PhraseExpress. But what if you’re using paper? Well, on paper, you don’t have access to text-expanding apps… but you do have shorthand writing systems. These are systems that vastly cut down on the characters or strokes of a pen needed to express an idea. 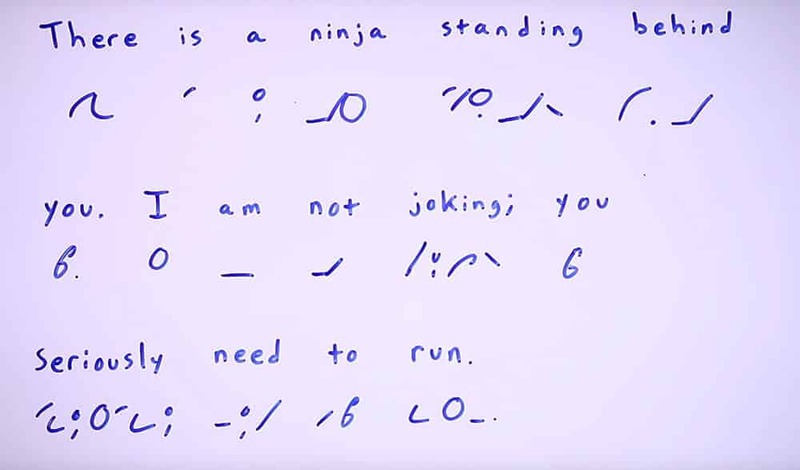 The process of writing in shorthand is called stenography, and it’s an art that basically every journalist had to learn before digital audio recorders became widely used. The origins of shorthand date back to Ancient Greece in the 4th century B.C., though even before that, scribes in Ancient Egypt developed two different systems – the Hieratic and the later Demotic – which let them write more quickly than they could using complicated hieroglyphics. These systems use phonetic symbols; that is, their symbols aren’t one-to-one approximations of the standard Latin characters that make up the English alphabet (and many others). Rather, they’re symbols designed to represent how words sound when they’re spoken. Masters of these systems have been known to write at speeds of over 200 words per minute, which means they could take down almost any spoken word verbatim – a must for ensuring accuracy in fields like journalism and court reporting. Here’s the big problem with systems like Gregg and Pitman, though… they take way too long to learn! People who want to become proficient at these shorthand systems have go through tons of structured learning and months of difficult practice. As a student, you almost certainly don’t have time to do something like this – and honestly, you probably shouldn’t anyway. 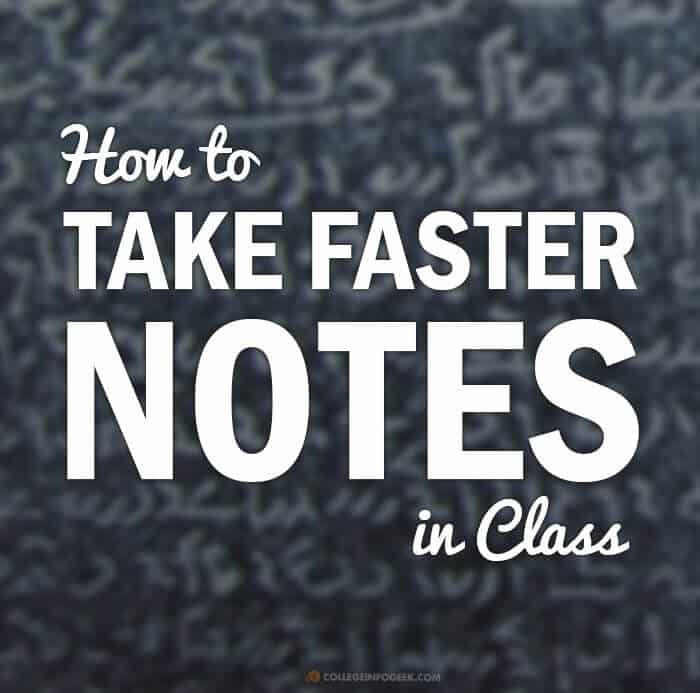 Your priority while in class should be to learn much as possible – to grasp the concepts in addition to the syntax – and as we’ve discussed before, ultra-quick note-taking can be a detriment to that goal. So here’s the rub: Learning a shorthand system like Gregg or Pitman is too time-consuming to be useful, but writing all your notes in longhand takes too long and is giving you early-onset Carpal Tunnel. What’s the solution? Well, actually, I’ve got a two in mind. 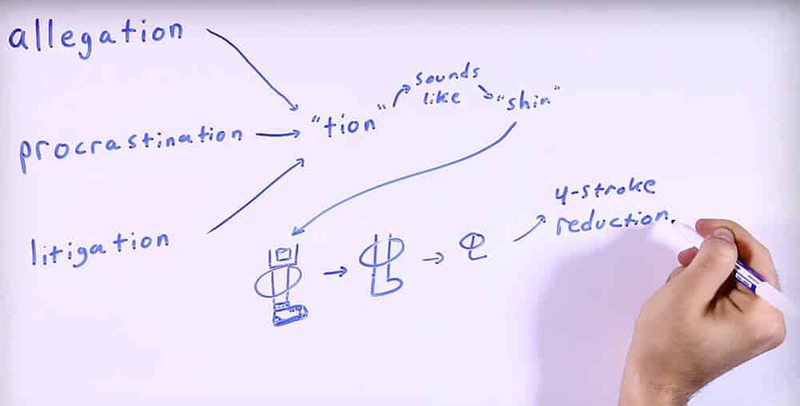 Since shorthand has been around for thousands of years, it’ll be no surprise that many people have taken a crack at developing their own systems. One promising subset is alphabetic shorthand systems; these use the standard latin characters you’re already familiar with, and they drop vowels and make abbreviations to help you increase your note-taking speed. Now, some shorthand purists will turn their noses up at these systems like snooty, aristocratic gentlemen with curly mustaches and pocketwatches. They’re certainly not as fast as systems like Gregg or Pitman. However, the trade-off is that they take far, far less time to learn. Another option is using a system that does utilize its own custom character set – but one that’s much easier to learn than the character sets of Gregg or Pitman. The most famous example of this is probably Teeline, which some journalists still use today. While doing research for this article, I came across a more recently developed system called Ford Improved Shorthand, which caught my eye because it’s supposedly meant to be learned within just 15 minutes. …and found that I actually was able to memorize the characters after writing them just once or twice! It still takes me a bit of time to actually read what I wrote earlier, but early results indicate that Ford would be pretty darn easy to learn altogether. Since you’re most likely the only person who will ever need to make use of the notes you’re creating, why not customize the way you write them? And if you’re going to do that, there’s no need to try to create a system that’s easily learnable by anyone; you can create symbols that have meaning to you – and are therefore easy to learn. Since I like to pull names out of thin air, I’m going to call these “mnemonic glyphs”. Each of these ends with the suffix “tion,” which sounds a bit like “shin” to me. It’s also a suffix that requires six strokes of the pen to write. …and now you’ve got a 2-stroke symbol that means the same thing! 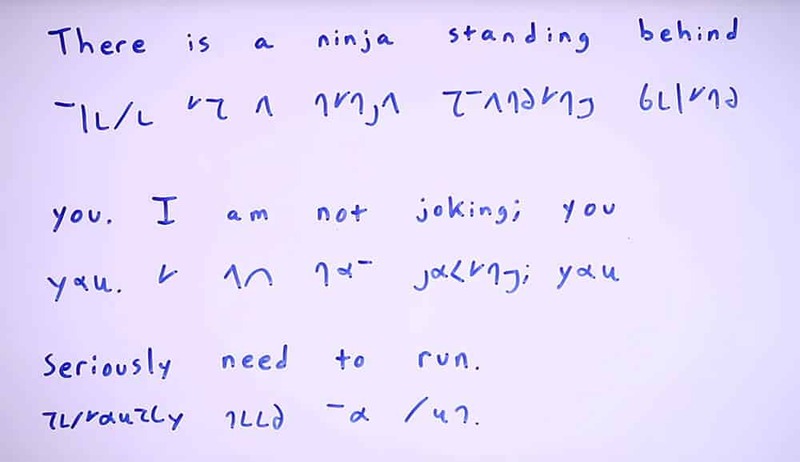 The great part about developing your own shorthand system is that you can do it gradually, which means you shouldn’t have to spend much time learning how to read what you’ve written. At first, you symbols will be sparse, and most of your notes will be written in longhand – giving you a lot of context for interpreting those symbols in case you forget what they mean. This solution very much depends on you – so if it strikes your fancy, start experimenting! Remember, shorthand is definitely not the only way to compress your notes. You can also draw diagrams, connect ideas and concepts with arrows, etc. If you’d like a look at some methods that lend themselves well to these techniques, check out my video on the five best note-taking systems. 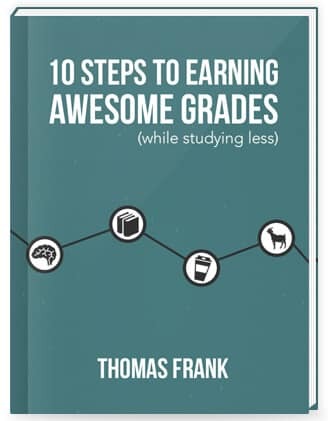 If you found this article useful, I think you’ll also enjoy my free 100+ page book called 10 Steps to Earning Awesome Grades (While Studying Less).